Huge congratulations are in order for cellist Elie Boissinot, who won the 2018-2019 Golden Violin Competition on Sunday afternoon with an exemplary 30-minute performance before a four-person jury and enthusiastic audience. Accompanied by collaborative pianist Wei-Tang Tuang, Elie’s winning program included Variations concertantes, Op. 17 by Mendelssohn, an excerpt from Prokofiev’s Cello Sonata in C Major, Op. 119 and Ligeti’s Sonata for Solo Cello. Elie is pursuing a Bachelor of Music in Cello Performance with Elizabeth Dolin at the Schulich School of Music of McGill University. Recently, he’s been the recipient of several awards, winning the 2018 Hnatyshyn Foundation Developing Artist Grant and the Lloyd Carr-Harris String Scholarship at McGill. He has received first prizes from, among others, the Canadian Music Competition and the Festival de musique classique de Montréal. Elie is also the principal cellist and artistic director of the Orchestre Philharmonique et Choeur des Mélomanes (OPCM), an ensemble he co-founded with Francis Choinière in 2015. In recent years, Elie performed concertos with the Orchestre Philharmonique des Musiciens de Montreal (OPMEM), the Orchestre Symphonique des Jeunes de Montréal (OSJM) and the FACE Symphony Orchestra. He has also held first chairs in the McGill Symphony Orchestra (MGSO), the OSJM, and the Orchestre Symphonique du Conservatoire de Montérégie. As winner of the 2018 McGill Concerto Competition, he will perform Elgar’s concerto with the MGSO in February 2019. Elie plays on an instrument and bow generously loaned by Canimex Inc. of Drummondville, QC. All of the finalists (violinists Alicia Choi and Elizabeth Skinner, violist Justin Almazan, and Elie) are some of Schulich’s most accomplished string players. After being nominated to participate in the competition by members of the school’s String Area through a rigorous selection process, a total of six students participated in the semi-final round on October 21. While all of the nominated students demonstrated exceptional talent, only four could continue to the finals. The jury for this year’s final round was made up of Schulich faculty members Denise Lupien and Alexis Hauser, guest jurors Taras Gabora and Shauna Rolston, and Jean-Sébastien Vallée, who acted as jury chair. The Golden Violin Award itself was established in 2006 by businessman and philanthropist Seymour Schulich, a year after he donated $20 million to McGill's Schulich School of Music. The competition’s first-place winner receives a generous scholarship (valued at $25,000) as well as a 14-karat gold violin lapel pin. This year, all of the other finalists also received a $1000 cash prize. In addition to the monetary award, the first-place winner is also acknowledged on the Golden Violin sculpture itself, which is made of pewter and gold plate and remains on permanent display in McGill's Marvin Duchow Music Library. Finally, the winner will be invited to appear in a public performance on Sunday, March 10, 2019, at La Chapelle historique du Bon-Pasteur. 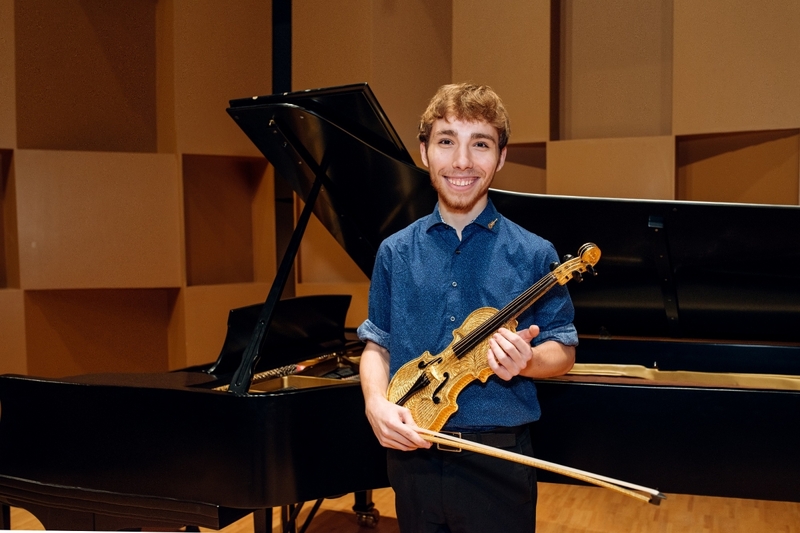 Previous winners of the Golden Violin award are among the most successful young performing artists in Canada and have become noteworthy ambassadors for the Schulich School of Music. The award’s twelve past winners are Emmanuel Vukovich, Lambert Chen, Chloé Dominguez, Aaron Schwebel, Ewald Cheund, Isaac Chalk, Baptiste Rodrigues, Victor Fournelle-Blain, Byungchan (Chan) Lee, Joshua Peters, Joshua Morris, and Maïthéna Girault.